Chandigarh edged past Delhi as they registered a narrow 1-0 in the Santosh Trophy North Zone Qualifiers Group A match played at MLSM College Ground, Sundernagar Himachal Pradesh earlier today. 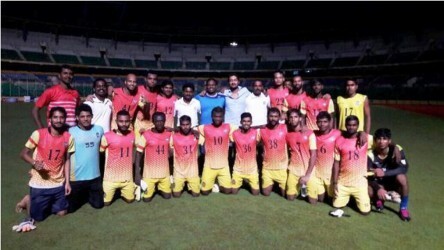 Delhi coach Abhijoy Basu made only one change to his side which lost against Uttar Pradesh in the last match as Nitin Rawat found his name in the starting XI replacing Dilli Ram Sanyasi, while Chandigarh were unchanged from the last match where they registered a 4-1 win over Himachal Pradesh. The match was equally contested by both the teams as the match witnessed an end-to-end affair. It was Delhi who created the first chance of the match when Nitin sent a perfect cross at the top of the box to Ankit Kumar Rana, but the U21 striker failed to connect the same. At the other end, Amandeep Singh headed wide off Girik Khosla’s cross in the box. Delhi’s Monu Choudhary tried his luck from distance but the Chandigarh keeper made no mistake to collect it. A few minutes later, Chandigarh were awarded a free-kick close to the danger area. Harpreet Bedi stepped up and sent a curling shot on goal but it rebounded off the crossbar to keep the score sheet clean. In the last few minutes of the first session, Chandigarh the custodian came up with a series of fantastic saves to keep his side away from any damage. First, he brilliantly blocked Yogesh Prasad’s header from six yards off Sonu Beniwal’s long throw-in. Next, he again superbly denied Monu from scoring from the top of the box. Later, the U21 keeper made a diving effort to stop Kamal Singh who dribbled past two defenders and sent a sparkling shot on goal. With both custodians preventing their opponents from scoring, both the teams went into the break goalless. Just a few minutes into the second half Delhi came close to scoring when Aditya Singh’s shot was well blocked by Chandigarh keeper Harpitpal Singh but he failed to clear it cleanly. The ball travelled to Kamal who nicely curled it to Dheeraj Singh who made a diving effort to reach the ball but did not connect. This was the only potent attempt by Delhi in the second session. Chandigarh tried to control the match from thereafter and marched many times on opponents. Harpreet tried to find Amandeep in the box but Delhi defender Sonu cleared it before he could reach it. Harpreet came up with one more cross from the right but this time Delhi keeper Vijay Parlap intercepted it on time. However, in the last quarter of the match, Chandigarh broke the deadlock through Amandeep when he blasted from point-blank range after receiving a short pass from Girik. Energized by a goal, Amandeep created two more chances but first, Delhi keeper Vijay block him in a one-on-one situation and later his long ranger was denied by the woodwork. After the second round of Group A matches, Chandigarh top the group with 6 points from two matches while Delhi suffered their second defeat of the tournament.